Is Santa Maria Novella Rose Water worth to buy? What is Santa Maria Novella? It’s not a name of a beauty brand rather according to Wikipedia it’s a church in Florence, Italy, situated just across from the main railway station which shares its name. Chronologically, it is the first great basilica in Florence, and is the city’s principal Dominican church. However this church that have a Perfume and Pharmaceutical along with it. They offer wide range of perfume, bath and body, ointment and balm as well as face care. It’s really a place that I would want to visit one day. Other than that, the design of the label is truly decadent and Instagramable. Everyone keep asking me what is it and whether it’s good or not? Jacqueline Evans is another skincare product that hailed from Australia. To be exact the home of Jacqueline Evans skincare is Malvern, Victoria. It’s no surprise that I jumped to the opportunity of trying the skincare from this brand. I wasn’t sure where to start with this brand. As with any other brand, I was playing it safe and opted for the face mist instead. Before I review the Jacqueline Evans Rooibos Facial Toner, let me first introduce you to the brand. Jacqueline Evans is a Naturopathic Skincare and classified as a premium organic skincare, though price-wise it ranges between AUS 18 – 78. With the most expensive product being the eye gel. The brand focusses on research so that they could find safe products yet effective. It contains only natural and certified organic ingredients. 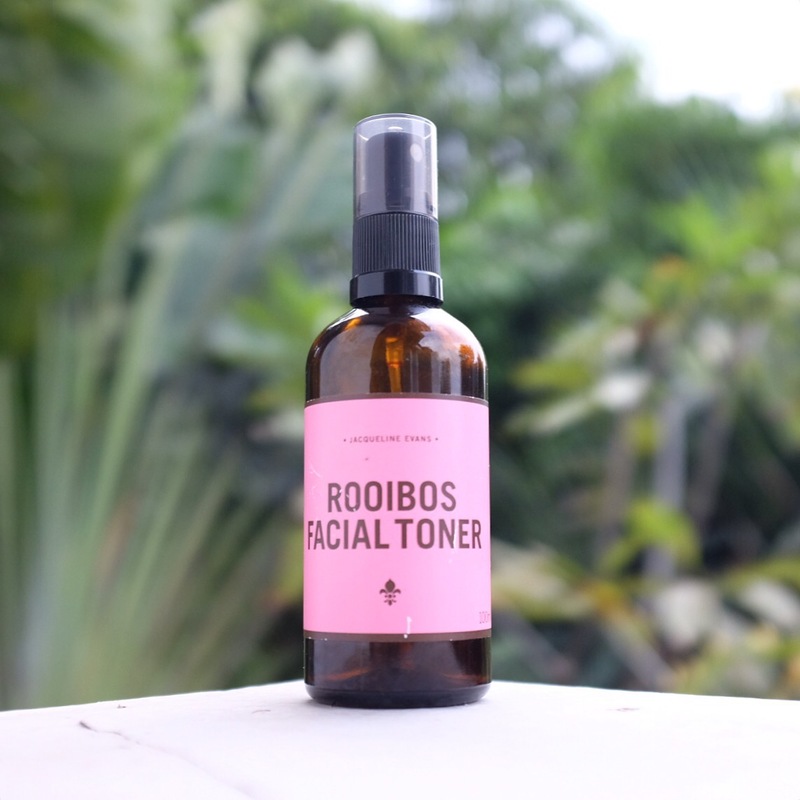 The Rooibos Facial Toner is a face mist that is packaged in amber glass bottle with a spritzer. The spritzer itself is easy to use and it disperse a normal amount of mist, the one that is not too fine and not that horrific that you feel like it’s raining cats and dogs. Instead of using water, Evans used organic rooibos tea and rose water for this beautiful concoction. The former ingredient lends its soothing and herbal scent of the product. I’m a tea drinker so using this product is a really pleasant experience for me. If you’ve ordered a rooibos tea from Starbucks before, you probably know what scent I’m talking about. It’s just this one is more delicate. What do I use Son & Park Beauty Water for? When a friend of mine went to South Korea, it’s hard to say no to her offer of getting me some of the good and affordable skincare from South Korea. There are cornucopia of products that garner interest of many of the Korean Skincare enthusiast and they’re often not that pricey. Off course, there are the exception of some luxurious brands that are also made it into my favourite as well. Among others, I asked her to get me these two products: Son & Park Beauty Water and Cremorlab Mineral Treatment Essence. So much hyped surrounding these two products and I must say it took me some trial and error to actually found a way to use these two. Today, I will be reviewing the Beauty Water first. So much question about this product. Whether I love it or not. How do I use it? I took it off straight from Soko Glam, where you can get this product at around USD 30 if you resides in the States. Not just a cleanser, it has mild exfoliation abilities with willow bark and papaya extract to help sweep away dead skin cells, revealing brighter skin tone and smoother texture. Lavender water, rose water, and orange fruit extract impart a subtle hydration so your skin canbe prepped to absorb the next skin care steps, while adding in a bit of moisture. Beauty Water can be used in the morning to create the perfect canvas for makeup application, midday as a refresher, and night after cleansing to whisk away remaining impurities. For normal, oily, dry, and combination skin types. Beauty Water has a pH of 5, effectively resetting the skin’s natural pH after cleansing.